And from December 2014 in which the reviewer, poet Mary Harwell Sayler, says in part “Neither a heightened imagination nor a high IQ mark a poet who writes with freshness and precision. However, the work of a poet who notices everything is likely to be brilliant.” She feels this book offers encouragement and examples to a growing group of women-poets, and wishes such a volume had been available when she started writing poetry many years back. 4/20/12 review by Christine Redman-Waldeyer, founder and editor of Adanna, a journal about women’s topics and issues; and author of two books of poetry. ” . . .a delicious array of topics guaranteed to stimulate your muse whether you are an emerging or established professional. The contributing authors offer invaluable insight into the gamut of writing issues. Congratulations to Carol Smallwood and Colleen S. Harris for gathering and editing this treasure book of wisdom.” – Dr. Barbara Harbach, co-editor, Women in the Arts: Eccentric Essays in Music, Art, and Literature, (Columbia Scholars Press, 2010) and Editor of WomenArts Quarterly Journal. “Women on Poetry fills a void in the poetry world. It is an entertaining read that will help female poets move to their next level. I caution you to keep a pen and paper handy to take notes or at least use a highlighter and small book marks to indicate the entries you will want to refer back to again and again. 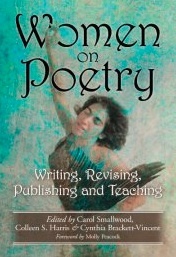 Molly Peacock’s Foreword stated these essays note poetry’s impact on our lives and the difficulty women poets have of being noticed by a larger world. There is something for every woman who has thought about the art of poetry…to learn, imbibe and react to in this book. The editors demonstrated an uncanny ingenuity as they gathered this talented diverse group of forty-three poets to create fifty-nine chapters on the craft of poetry for poets and poetry lovers. The different personalities of the writers kept the book interesting with their distinctive viewpoints. This volume was compiled with love and encouragement for all women poets no matter whether novice, or veteran, for poets who want a fresh approach. Isn’t it? Wish I could take credit for it. Sounds like a career there . . . beautiful covers are an art! yes maybe! don’t know if i could keep my nose out of the content though!